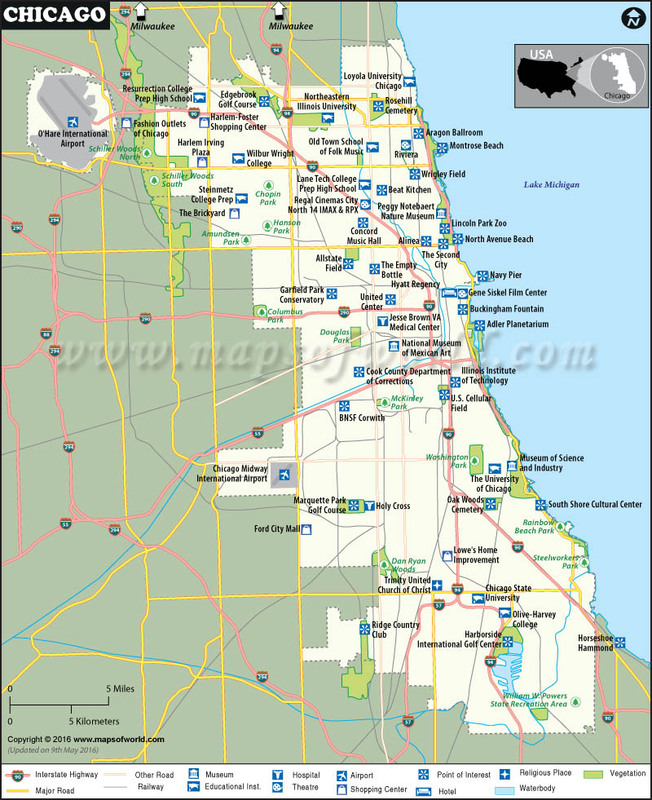 The Chicago map, IL shows the various important neighborhoods within the city as well as the important roads and educational institutions. 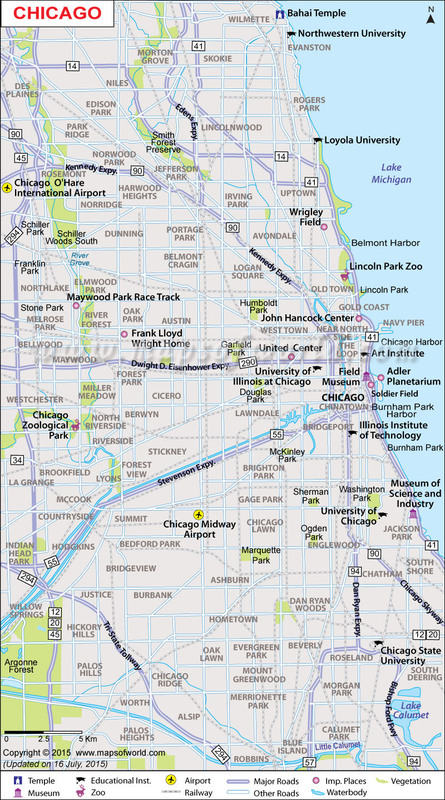 Some crucial points in the city such as the Chicago O' Hare Airport and Chicago Zoological Park are also shown in the map. The Map of Chicago depicts the infrastructure of the city such as airports, major roads, railways and Interstate Highway. Apart from this, the user can easily located important attractions and structures such as educational institutions, hospitals, religious places, shopping centers, theaters, hotels and other points of interest. On the map one can locate educational institutes such as the University of Chicago, Chicago State University, Loyola University Chicago and others. Airports such as O'Hare International Airport and Chicago Midway International Airport are also prominently displayed on the map. Prominent hospitals hotels shown on the map include Jesse Brown VA Medical Center and the Holy Cross. Other prominent places depicted on the map include Hyatt Regency, The Empty Bottle, Harlem Irving Plaza, The Brickyard, Trinity United Church of Christ, Fashion Outlets of Chicago, among others. To describe Chicago briefly is like hugging an elephant; something has to be left out. It's hard not to reminisce about the good-old days when Michael Jordan used to slam dunk and jazz was king on the south side of Chicago. Also known as Chicagoland and the City by the Lake, its picturesque skyline and shoreline call millions of tourists to its renowned museums, concert venues, shopping districts, and urban parks. Chicago was the first choice for the people who longed to escape the Jim Crow laws and wanted a slice of American Dream. The 'City of the Big Shoulders' is quintessential American if not so Midwestern. Citizens from over 130 nations inhabit a rich tapestry of its neighborhoods. Hence, it's no wonder that it has its own cosmopolitan character, history, songs, and language. The Windy City may not be as hyped as Los Angeles or New York but it has just as many attractions rolled up its sleeve. And perhaps the only city that can rival NYC's Broadway scene. The city stands out like a shining beacon along the southwest shores of Lake Michigan in the northeastern Illinois, US. By Air - Chicago O'Hare International Airport (ORD), 17 miles from downtown, is among the busiest airports in the world. Midway International Airport (MDW) is a secondary gateway served by Southwest Airlines and Delta Air Lines. By Train - Metra is a commuter rail system in the Chicago metropolitan area. Chicago Union Station is a major hub for East Coast and West Coast-bound Amtrak passenger trains like Lake Shore Limited, Capitol Limited, Cardinal, City of New Orleans, Texas Eagle, California Zephyr, and Empire Builder. By Road - I-90, I-290, and U.S. 41 are major roads to enter the city. The Chicago Transit Authority (CTA) operates buses and trains in Chicago and its suburbs. Greyhound, Indian Trails, Megabus, and Burlington Trailways provide bus services to nearby cities. "Chicago is an October sort of city even in spring". Locals have a whole new definition of winter and find 10ºF "not that cold." The shoulder seasons of September-October and April-May are ideal to visit Chi-town. Most tourists flock here in the summers and in winters it's possible to get more miles on a snow-blower than a car. Be it in Hyde Park or Chicago Loop, city has a fair share of attractions to keep visitors busy days on end. Museums - The encyclopedic museum of Art Institute of Chicago exhibits a variety of paintings, prints, photographs, sculptures, decorative arts, and architectural drawings. In Near South Side, the Museum Campus is home to Field Museum of Natural History (one of the largest of its kind in the world) and Adler Planetarium (America's oldest planetarium) are major highlights. The Museum of Science and Industry has child-friendly interactive exhibits, a coal mine, a submarine, LEGO bricks, and world's largest T-Rex. Theme Parks - The ghoulishly themed area of Haunted Trails is the place for those looking for thrills and chills. While Monkey Island is a popular indoor amusement center, Indian Boundary Park features lagoon, outdoor playgrounds, and tennis courts. Hollywood Park, Skokie Water Playground, and Safari Land are other popular family attractions. Zoos - Opened in 1868, Lincoln Park Zoo houses 1,200 animals representing 230 species. Situated in the largest park in the city, it welcomes visitors every day of the week for free. Another popular wildlife park, Brookfield Zoo is home to around 450 species of animals in an area of 216 acres. Various animal exhibitions include Australia House, Big Cats, Rain Forest, The Savannah, and Seven Seas. Shedd Aquarium - With more than 32,000 creatures in five million gallons of water, Shedd is the perfect place for kids and families to learn about oceanic and aquatic ecosystem. Australian Lungfish, Beluga whales, Alaskan sea otters, California sea lions, and sharks call this aquarium their home. Willis Tower - The 442-m-tall tower is as iconic in the city skyline as the Empire State Building in New York. Formerly known as the Sears Tower, it is the most popular tourist attraction in the city. Scores of people reach its Skydeck (observation glass deck) to get city vistas and bird's-eye views of the plains of Illinois. From sternly classical to space-age, the downtown area is a place with an embarrassment of architectural riches. Grant Park - This 319-acre urban park in the Loop neighborhood is a vital green corridor amidst the sea of concrete. Buckingham Fountain - a famous landmark in the center of the park - features water displays and light shows everyday in summers. Often called "Chicago's front yard", it hosts public gatherings, art exhibitions, and several annual events. Wrigley Field, Gateway Theatre, Skate Plaza, Lincoln Park Conservatory, John Hancock Center, and Robbie House are other prominent places to swing by. It's a daunting task for an occasional visitor to keep up with Chicago since it's never dull out here. Saunter along the Chicago Pedway, check out the The Bean (also known as Cloud Gate), tour the Windy City on a bicycle, and sample your way through city's most popular food scene. Navy Pier - Regardless of the weather, the pier is always packed with tourists. This hot spot features a plenty of shops, eateries, and parks plus a bevy of sightseeing tours. Go for a ride on the 150-ft-high Ferris Wheel, catch the comedies and tragedies played at Chicago Shakespeare Theater, let your kids explore the Chicago Children's Museum, or aboard a boat cruise on the Lake Michigan. The Chicago shoreline is among the cleanest urban waterfronts in the world. Plenty of seasonal events and activities along the 26-mile-long shoreline offer respite from the crowd. Parks and Recreation - The Chicago Park District includes 8,100 acres of green space, 77 swimming pools, 23 beaches, ice rinks, golf and mini-golf courses, batting cages, and other active pursuits. Millennium Park is famous for its architectural virtues, art displays, and cabaret and theater performances. Head out to the waterfront and walk, run, blade, and even rock climb, enjoy skating in Midway Park, catch 'da Cubs' and 'da Bulls' in action, trace the attractions on the Lakefront Trail that runs from Hollywood Beach to the South Shore Cultural Center. For those interested in city's past, see the African-American roots in Bronzeville and Kenwood, taste Indian cuisine on Devon Avenue and Persian cuisine on Kedzie Avenue, learn about Swedish and German ties of Chicago in Andersonville and Lincoln Square, hear the bells of St. Michael's in Old Town and visit the Victorian-era buildings that survived the Great Chicago Fire. Shopping - A stretch of Michigan Avenue called 'The Magnificent Mile' is a lively boulevard with galleries, boutiques, and restaurants. Find top brands, designer labels, and upscale merchandise at Chicago Premium Outlets Mall and Gurnee Mills Outlet Mall. Take a bargainer's stroll at the eclectic Oak Street and hang out with locals. Dining and Theater - Cadillac Palace Theatre, Oriental Theatre, Theater on the Lake, and Chicago Theatre showcase best of Broadway musicals. Buddy Guy's Legends, Kingston Mines, and Rosa's are some of the top destinations for enjoying blues and jazz music and having BBQ. City's love affair with deep-dish pizza, Polish sausages, Chicago-style hot dogs, and Italian beef sandwiches is legendary. In fact, it has an ongoing cold war with NYC over who can serve up the better slice. Festivals - Taste of Chicago, held in July, is the largest outdoor food festival in the world. There's nothing quite like the celebrations of St. Patrick's Day in Chicago. Grant Park Music Festival, Chicago Blues Festival, Lollapalooza, and Chicago Air & Water Show are other notable events. [an error occurred while processing this directive] Click to know about the Most Windy City in the World.